THE WBBL TEAM TRAVELLED TO BIRMINGHAM FOR THE CUP FINAL AND WE WENT ON THE ROAD WITH THEM TO BRING YOU THE INSIDE STORY OF THIS UNBELIEVABLE DAY. A Saturday night at a Holiday Inn in Birmingham isn’t the normal place you would find a group of pristine athletes, but with the Women’s British Basketball League Cup Final being held at the city’s Arena at midday on the Sunday, there was no better choice for the Sevenoaks Suns to prepare for their final showdown against Sheffield Hatters. Head Coach Len Busch and his assistant James Hussain had realised that a two-and-a-half-hour road-trip was not the best preparation for such a monumental occasion and had taken the decision to stay over after practice in Surrey just a few hours before. The team checked-in probably a little later than they would have liked, but such was the weather on the motorway, it was 100 yards of visibility in the rain. Once the girls had had time to relax and get changed, it was dinner at the local Harvester for the entire squad. The mood was seemingly relaxed and jovial, players on their mobiles, sharing laughs and photos with each other whilst they ate healthily but substantially. Not any different to many hockey and rugby teams when on away duty representing the town of Sevenoaks. Sitting there that evening I recalled my conversation with Len Busch, the Head Coach, a few weekends before after a match at the Sennocke Centre, when I asked him if I would be able to follow the team for the weekend as they prepared for the final. In his usual calm way he simply said ‘that sounds like a wonderful idea!’. Now I was sat with Len and his team, having a beer and discussing tactics. Len and James began to go through their game-plays for the final, and much to my amusement, discussing in detail, with salt and pepper pots replicating the girls on the court, how they would mastermind the win. Sevenoaks Suns enjoying their pre-match meal before heading back to their hotel. It was fascinating to simply listen to two guys having a beer and discussing options that they would be charged with making a reality the next morning. It was like they were the only two in the restaurant, and by no means did I get the feeling that it was preparation for such a huge event. The WBBL and BBL Cup Finals receive such fantastic support each year that they need to be held at a relative venue. For the third year running this was the Arena Birmingham which has a capacity of 15,800. The calmness that Len and James had at dinner is the same calmness that has led them to win multiple National titles with the Suns on so many different levels. This was still present as Coach Busch delivered his parting gift before the girls retired, providing a well thought out team talk to unite the girls and to give them the confidence. Sevenoaks Suns having a team talk back at the hotel the night prior the final. 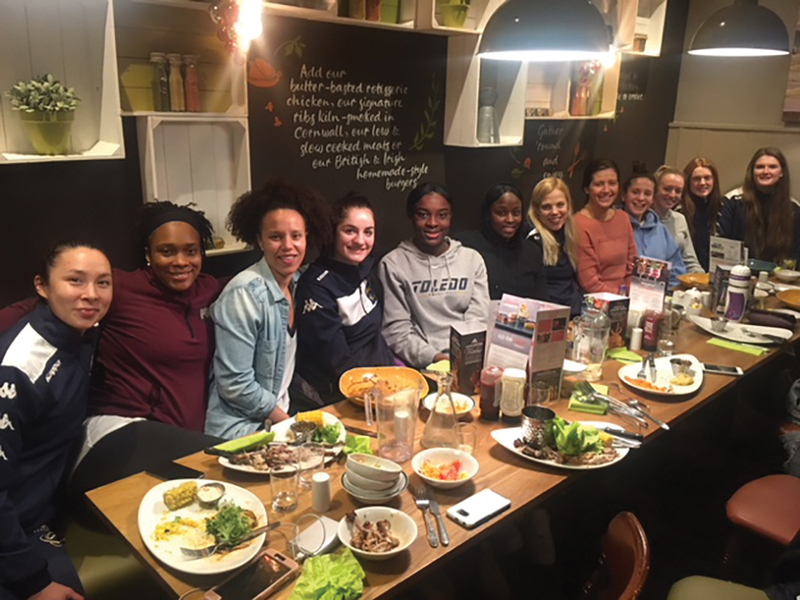 The mood at breakfast the next morning was just as relaxed as the night before, with the girls taking on much needed energy for the looming tip-off against their closest rivals in the league, Sheffield Hatters. At 10am they left the comfort of the hotel and travelled the short distance to the Arena Birmingham where they started to prepare themselves for the match. A gentle warm-up behind the curtain and a chance to meet some of their travelling fans is all but second nature to these girls. 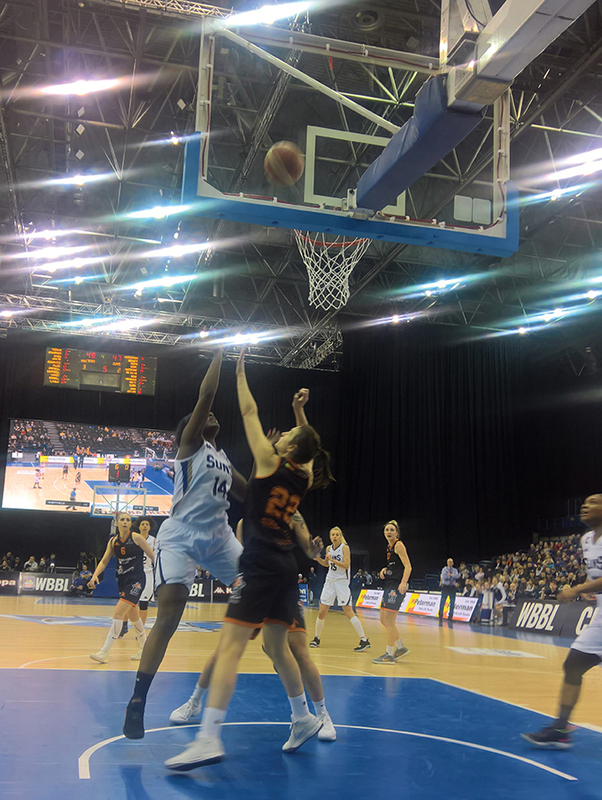 What was to follow was an iconic moment in the history of the British Basketball Cup Finals as Westfield Health Sheffield Hatters came up with a game-winning three-pointer leaving just 1.4 seconds on the clock. The Suns were led by Cat Carr, who had 21 points, nine rebounds and 10 assists, and Janice Monakana, who added 14 points, however it was Sheffield who made the better start, holding the Suns scoreless for more than six minutes in the first quarter as they posted a 10-point lead in the first seven minutes. This is something that rarely happens to the Suns, they are normally in complete control from the buzzer. Sevenoaks came back however to within four points at the end of the first half as Carr hit seven points in a row but the Hatters, led by Alison Gorrell’s aggressive offensive play, restored a 12-point lead midway through the third quarter. Sevenoaks started the final period with an 8-1 surge to give them the lead following a three from Jess Good with three minutes remaining and, despite Sheffield’s strong response, Carr’s shot from the top of the key with 7.4 seconds remaining seemed to have completed a Suns victory. Out of the timeout though, Sheffield stayed patient before Naylor splashed her belated winner to give Sheffield victory. Sevenoaks started the final period with an 8-1 surge to give them the lead following a three from Jess Good with three minutes remaining. Carr almost came up with the game-winner herself though in a thrilling conclusion to the Cup Final but subsequently missed her three-point shot with just 1.4 seconds on the clock. She finished just short of a triple-double in the heart-breaking defeat – a first for the Suns since last year’s Trophy Final. The final countdown: with just 1.4 seconds left on the clock, Ta’Yani Clark (left) tries to find Cat Carr (right) to win the game. Car Carr used the post-match press conference to concentrate on the rest of the season saying: “We’ll just use this as motivation continuing on through the season”. So, Sheffield make history with the win by completing the full set of WBBL titles, and what a way to do it too. It was devastating to watch Sevenoaks take to the floor and applaud their opponents as they lifted the Cup, but the way the team conduct themselves is something to be applauded itself. These young women are doing magical things for the sport and the youngsters who will inevitably follow in their footsteps. Something tells us they’ll be back to winning ways soon. The Trophy? The Championship? The Playoffs? Whatever it may be, we’ll be right behind them! Will you?